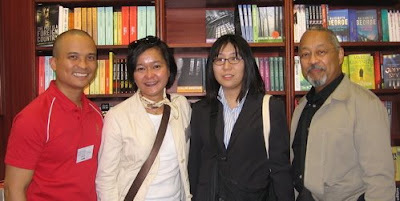 From left: Me, May Jurilla, Megumi Ishida and Amadio Arboleda. Book historians study the social, cultural, and economic history of authorship; the history of the book trade, copyright, censorship, and underground publishing; the publishing histories of particular literary works, authors, editors, imprints, and literary agents; the spread of literacy and book distribution; canon formation and the politics of literary criticism; libraries, reading habits, and reader response. More concrete examples may be seen in the papers we presented. 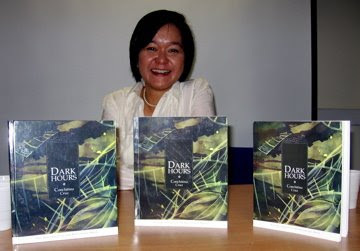 Patricia May B. Jurilla, author of the newly-published Tagalog Bestsellers of the Twentieth Century, spoke on "Book Alike: Publishing and Photocopying Textbooks in the Philippines." The photo below illustrates the question that went through the minds of those who attended the session: Which one is the original book and which are the photocopies? Megumi Ishida and Amadio Arboleda presented a paper on the "Catalytic Role of Major Bookstores in National Book Culture: Case Study of Maruzen Company, Ltd." We all considered Ishida an honorary Filipina because she did her thesis on "The Role of Bookstores in Book Distribution: The Case of the Philippines." 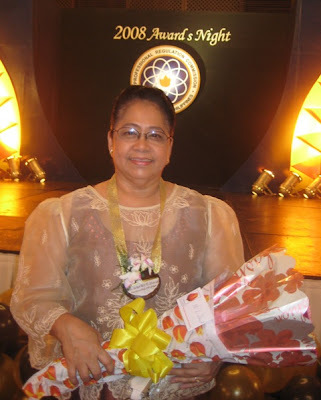 Arboleda, her mentor, is Filipino, finished high school and college in the Philippines, and has lived in Japan for more than three decades. We were joking about how Filipinos all seem to be related, when Jurilla and Arboleda discovered that they do have a common link, and may in fact be related to one another! My paper was on "Teodoro Agoncillo's History of the Filipino People and the History of the Filipino History Book." All of us were part of different panels, but mine was the only one where we were all present because Jurilla and Ishida-Arboleda were on panels scheduled at the same time. If you're interested in learning more about book history, a panel entitled "On the History of the Book in the Philippines" will be held at the forthcoming 8th International Conference on Philippine Studies. Papers will be read by Ambeth Ocampo, Karina Bolasco, May Jurilla and myself. For her sterling accomplishments as an internationally renowned professional, demonstrating exemplary dedication, competence and integrity, thus earning for her prestigious awards including the Library Technology Award of the University Microfilms International in New York and the Excellence in Library Automation Award of the Electronic Online Systems International; for her invaluable contributions in preparing the United Nations Educational, Scientific and Cultural Organization training modules on library management, information and communication technology, marketing information services, digital libraries and intellectual property rights; for her active involvement in various local and international professional activities which have put Filipino librarians at the forefront of international librarianship; for her able leadership of the Philippines Librarians' Association, Inc.; and for selflessly sharing her knowledge and expertise through published works and papers delivered at international and local conferences. Thanks to Elvie Lapuz for providing the photo and citation. The print version of Library of Congress Subject Headings (LCSH; five thick red volumes) is what many catalogers have used for a long time. Some catalogers have begun using "Library of Congress Authorities," which is freely searchable online. But just today, a participant at a session I attended shared that the entire LCSH has recently been uploaded at lcsh.info, which is an experimental service that aims to "encourage experimentation and use of LCSH on the web." It's far from being an ebook that non-techies like me can use easily, but if you understand what Simple Knowledge Organization System (SKOS) is all about, you might be able to make it work for you and develop new ways of using LCSH online in non-traditional ways, aside from not having to buy a new set every few years. See some of the possibilities at "Semantic Search the US Library of Congress." If you know what an API is, you should check out the summary. I'm now in Seattle for SLA 2008, where I'm also blogging for the SLA Blog. As usual, I've been getting together with Filipino librarians. Unlike previous occasions when most of those who showed up were male, this time we were all male. 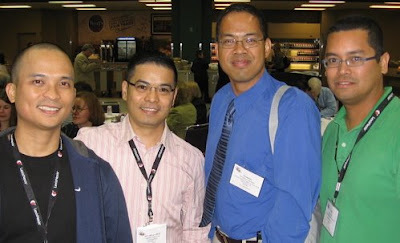 I met Craig at SLA 2007, Jay and I had agreed to meet via email, and I just walked up to Christian and asked him if he was Filipino (which I've done with others in the past). Grace Villamora was supposed to join us, but she obviously didn't make it. It would have been nice if Jose Escarilla were around, but he's retired, so he's probably not even here. The photos above include some of the evidence that I saw of the growing influence of the Filipino community in Vancouver. The photos of the restaurant and remittance centers were taken not in some suburb, but on one of the busiest streets in Vancouver. Two non-Filipinos are included in the album for reasons that will be made clear below. And just in case you're wondering, I did meet Filipino librarians in Vancouver, but you won't see them here because I'll be devoting a separate post to them. Ayeza is the pseudonym of a Filipina who migrated to Canada with her parents in the 1990s and got her nursing degree here. She is the owner of Balikbayan Box and was one of my very first friends in the Pinoy blogosphere. One of the most remarkable things I learned about her when we finally met in person was that she usually doesn't bring much with her when she goes to the Philippines, but she does bring a balikbayan box full of Filipino goods with her when she goes back to Vancouver. Yan ang Filipina! Edgar Wickberg is best known today as the American who rescued the Chinese in the Philippines from the relative obscurity to which they had been relegated by historians before he came along in the 1960s. I thought he turned his back on the Philippines afterward and moved on to doing research on the Chinese in Canada, but I was pleasantly surprised to learn that he merely "took a holiday for twenty years," and still knows what's going on in the Philippines. He's now 81 years old, retired, and is dealing with prostate cancer, but still strong enough to drive his car to meet with a PhD student who wants to talk to him about his work on the Philippines. Updated 7 July 2008 with correct names. Thanks to Becca! Here's hoping other Filipino librarians who get together outside the Philippines will post their photos, too, and maybe write about what it's like to work as librarians where they are. And no, I'm not discriminating against those in the Philippines—I know they have a lot of photos online. I came to Vancouver along with an estimated 9,500 academics for the annual Congress of the Humanities and Social Sciences (CHSS). Four of us from the University of Toronto's Faculty of Information Studies presented papers at the annual conferences of the Canadian Association for Studies in Book Culture and the Canadian Communication Association. I have since moved to my aunt's place in Surrey, and will be staying here until it's time to go to Seattle for SLA's annual conference. I will, as usual, visit libraries in Vancouver and try to connect with Filipino librarians. So if any of you know any Filipino librarians in Vancouver or Seattle—or perhaps you're attending the SLA conference—please leave a comment so I can get in touch with you. I've already met a few people, but I don't think anyone will be as memorable as my aunt, whom I never got to know before in the way I have in the past few days. One of the corny-but-true things she shared with me is that her name (Fe) is at the end of liFE (get it?) and that liFe without the F is just a lie. After all, without all those important F-words (! )—like fun, friends and... never mind LOL—life wouldn't really be worth living. If a student raises her hand in a class on Philippine literature and says, "Hindi ko maintindihan ang Tagalog" (I can't understand the Tagalog), should the teacher say, "Eh kasi tanga ka" (That's because you're stupid)? Well, this was essentially what happened when blogger-columnist Connie Veneracion complained that she and her husband, who were in fact trying to help their daughter, couldn't understand the Tagalog used in Mga Ibong Mandaragit by Amado Hernandez. Exie Abola, another blogger-columnist, pointed out that Veneracion's attitude toward literature was unfortunate because she is "an adult, not a seventeen-year-old, and a parent at that." Other writers and bloggers would not be as restrained in their responses. Ibong Mandaragit dot com, a website dedicated to understanding the book was set up, but it seems its owner hasn't gotten past the first chapter. As far as I can tell, the "debate" degenerated into an unhealthy my-argument-is-better-than-yours, you're-so-stupid, one-sided "contest" that has all but obscured the important-but-apparently-not-important-enough-to-ask-their-opinion protagonists: the readers. It's important to remember that this debate is not about Veneracion. She is not the enemy. She is a reading advocate (see her posts on "reading") who is making a complaint about the Tagalog used in Philippine literature. Maybe she's arrogant, maybe she generalizes too much, maybe her arguments don't make sense. But the way I see it, she is a customer providing feedback. In a previous life, I learned that "a complaint is a gift" and "don't shoot the messenger." And so, as my contribution to this blogosphere "controversy," I analyzed the search results on Google Blog Search for the term "ibong mandaragit" last 25 May 2008 to see what bloggers had actually written about the book since the beginning of the year. Unfortunately, I did not bring the papers on which I jotted down the numbers, so I'll have to share the stats when I get back to Toronto from Vancouver, but out of the 97 hits, only very few—not counting those who were reacting to Veneracion—wrote about the book in a significant way. Below are all of those that indicated whether they dis/liked the book or found its language difficult to read. It certainly seems as if Veneracion was not merely speaking for herself. Maybe some researcher will see this and think of doing a more in-depth study, instead of relying on the reactions of the literati to Veneracion's complaint. xe super inaalagaan ko yung books ko, any book (except yung mga walang kwenta talaga like mga ibong mandaragit). At my last day, teacher Mayet said that I could borrow the book entitled, mga ibong mandaragit at the library. I was required to read it. It was like summer class, but harder. I was given 3 weeks, and all I could read was 10 chapters. I'm not a fast reader, especially in filipino, in english, I'm okay... The book was really hard to understand, and the words are very deep, that I needed a tagalog dictionary all the time. how fast can you read a book? or better yet how fast can you read a chapter or even a page of my all time favorite book Mga Ibong Mandaragit? If the Filipino really loved his own language he'd actually enjoy reading the Noli, or Mga Ibong Mandaragit. Hell, I have. But he can't even muster enough willpower to do that-- ask any high school kid. I, CAELA, HAVE FINISHED READING IBONG MANDARAGIT. I'm cramming my Filipino book report. Imagine this - cramming 402 pages of deep tagalog Ibong Mandaragit in 3 days 2 nights! Hah! My procrastination is seriously not funny. But why am I doing this? Well, the simple answer is this: READING MGA IBONG MANDARAGIT GIVES ME A BRAIN..drain? wash? wring? You see, it's like putting your brain in a blender. I don't get the most of it, and I'm sick and tired of Dolly flirting with Mando. Ohplease. Mando doesn't like you. In fact, he likes his COUSIN Puri. Plus, I'm getting sick of Mando writing LOOOOOOOONG letters to everybody. Reading his letters to Magat, Tata Matyas, Puri (and the like) is NOT NICE. He writes these very long letters which takes 4 or 5 pages (or even more) and I don't even understand what he is trying to say. Bottomline: Mando is a BAD WRITER. He takes too long to get to the point, and he puts in a lot of details which are not really essential. He puts in news clippings, too. Plus, he puts in lots of flattery in writing to Puri, which I think still doesn't erase the fact that PURI IS HIS COUSIN. Hello?! Ugh.